On Friday, Nov. 16, as part of the Vision 2028 Leadership Summit, the New Jersey Council of County Colleges presented the first statewide Community College Distinguished Alumnus Award to Salem Community College Alumnus Paul J. Stankard. The Distinguished Alumnus Award is presented to a New Jersey community college graduate who has made significant contributions in his or her profession and community that have brought honor to New Jersey’s community colleges and the State of New Jersey. Stankard was recognized for his unparalleled contributions to the field of glass art and his alma mater. 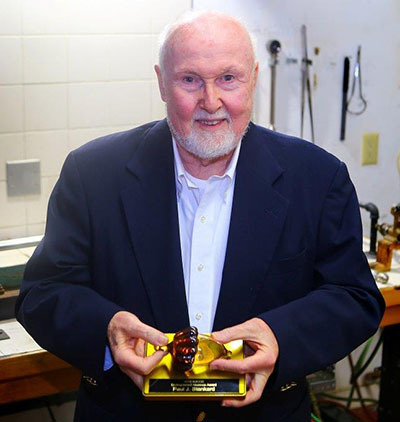 He has received three honorary doctorate degrees and many awards within the glass community, most recently the Masters of the Medium Award from Smithsonian's The James Renwick Alliance and Glass Art Society’s Lifetime Achievement Award. In 2001, Stankard founded Salem Community College’s International Flameworking Conference (IFC). The IFC celebrates excellence in flameworking by exposing SCC students and conference attendees to many of the world’s leading glass artists using the flameworking process. Stankard became chair emeritus following the 18th annual IFC. He is an Artist-in-Residence and Honorary Professor at Salem Community College.